SEATTLE, April 24, 2018 /PRNewswire/ — La Panzanella® Artisanal Foods Co., maker of the top-selling Croccantini® gourmet cracker, introduces its line of Gluten-Free Oat Thins cracker. The new Oat Thins cater to the growing population that seeks snack options that are healthy and flavorful yet conform to a gluten-restricted diet. Launching this summer, Oat Thins will come in three great-tasting flavors with versatile, deli-friendly packaging for a suggested retail price of $4.99 for five ounces. La Panzanella Oat Thins cracker has a crispy texture and is made with whole oat flour. All ingredients are Gluten-Free Certified and Non-GMO Project Verified. 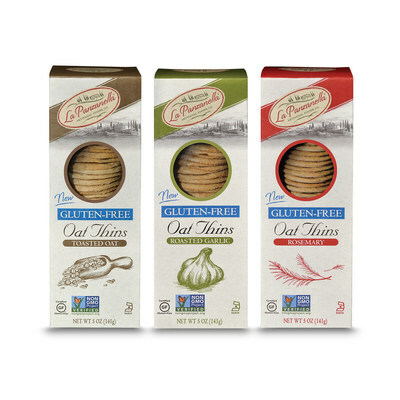 Oat Thins will come in three palate-pleasing flavors including Toasted Oat, Rosemary and Roasted Garlic. All of these flavors are baked in, and the crackers are made in small batches. This versatile, gluten-free cracker is ideal paired with cheese, hummus, dips, meat or dried fruit, and is great for snacking on its own. The Oat Thins five-ounce carton can be displayed horizontally or vertically for maximum merchandising flexibility. Gluten-Free and Non-GMO messaging is clearly marked on the packaging and the familiar La Panzanella branding reinforces trust with a brand that consumers know and love. Each flavor has clear visual cues including a unique color scheme and ingredient illustration on the front of the package to help shoppers identify their favorite flavors. A window on the packaging allows consumers to see the product, driving appetite appeal and increased sell-through.